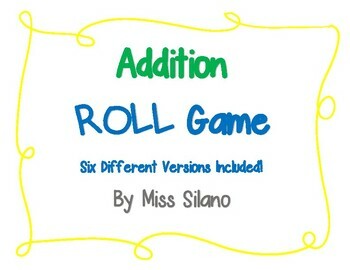 Use all versions of this Addition Roll game to make learning addition fun! Students will love setting up manipulatives, rolling a die, and adding together manipulatives. Students will also be able to use an expo marker to write in the addition sentence. 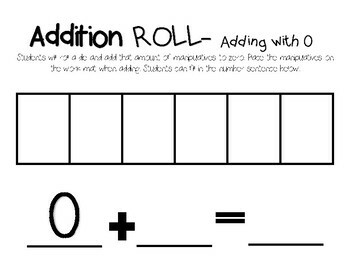 Great number writing, fine motor, and counting activity all in one! 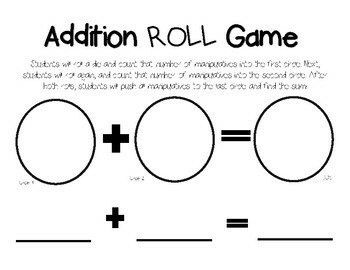 Awesome for math centers... this activity is open ended, which means students can play for their entire math center time without saying "I'm done!" Print pages on colored cardstock, laminate, or place in sheet protectors before use. Works best with mini bears, counters, cubes, tiles, or playdough. Students will also need a die or dice, expo marker and eraser. 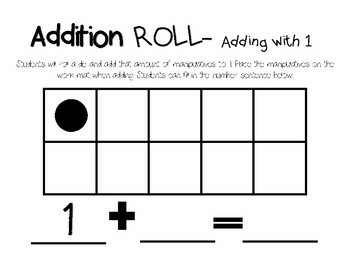 Visit my store for more subtraction resources!